Manaslu base camp trek is one of the popular trekking destination of that offers you an enchanted view of Mt Manaslu (8168m) and the natural surroundings. Mt Manaslu the 8th highest peak of the world is the best attraction of this fascinating trek. This fascinating trek into the Manaslu region lies at the border of Nepal and Tibet. Manaslu trekking region is flourished with fascinating natural landscape filled with colorful villages, green forest of and oak, classic view of deep blue Budhi Gandaki River and many more natural and cultural beauty all around. Manaslu base camp trek into the lap of mighty Manaslu is the desired trek for the adventurous lover because of its exotic and rough trekking trail. Natural beauties, Himalayan view and cultural villages are the scenic moment you share while trekking this fabulous trekking trail. Manaslu base camp trek starts with a scenic drive from Kathmandu to Sotikhola. This trekking trail passes through the historic place of Gorkha to the snowcapped high larkya La pass (5106m) offering you most scenic and exotic places around. This fascinating trek is a designed trek for those who loves to trek the adventurous and less populated trekking destination of Nepal. Commencing this adventurous trek let you explore the beautiful natural landscape of Manaslu region, deep George, rivers, snowcapped villages and there culture, old and ancient monasteries and shrines. The high altitude beauty, spectacular floras and faunas, sparkling glacier lakes will leave you breathless and mesmerize you with a lot of beautiful and adventurous memories. Explore the beauty of Manaslu region and experience the warm culture. Upon your arrival we assist you from Kathmandu airport to our hotel. Enjoy evening dinner and rest overnight. Day 02: Half day sightseeing and preparation for the trek. We offer you an experienced guide who will assist you to some of the touristic and sightseeing places around Kathmandu. Visit world heritage sites and prepare for the trek. Enjoy evening dinner and rest overnight. Day 03: Scenic drive from Kathmandu to Sotikhola (730m) by private transport. Today after breakfast we assist you from your hotel to our office. We ride a scenic drive from Kathmandu to Sotikhola. Enjoy the evening at Sotikhola. Rest overnight. Day 04: Sotikhola to Machhakhola (930m). 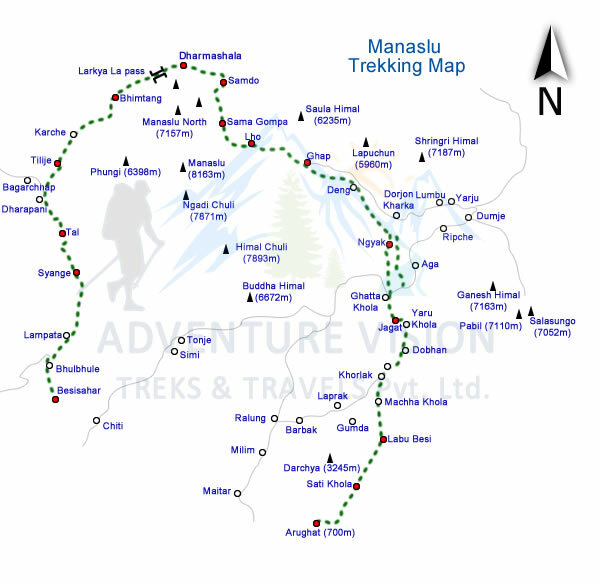 Today early morning we start our trek trekking the Manaslu region trekking trail from Sotikhola to Machhakhola. Explore the scenic beauty along the trail and rest overnight at the cultural village. Day 05: Machhakhola to Jagat (1340m). Today we trek from Machhakhola trekking for 4-5hours all the way to Jagat. Enjoy the scenic view of mighty Himalayas throughout the trek. Rest overnight. Day 06: Jagat to Dang (1860m). Today after breakfast we trek from Jagat to Dang walking for 5-6hours following the exotic trekking trail flourished with lush green forest and mountain scenic view. Enjoy the evening at local hotels. Rest overnight. Today we trek from dang walking for 5-6hours all the way to Namrung. This fascinating cultural village is rich in natural beauty and cultural warmth. Rest overnight. Day 08: Namru to Samagaon (3530m). 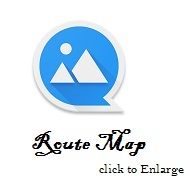 Today we trek from Namru to Samagaon walking for 4-5hours. This fascinating walk into the Manaslu region will surprise you with best sightseeing and panoramic view of mighty peak of Nepal. Rest overnight. Day 09: Rest day and visit to Manaslu base camp (4460m). Early morning hike to the nearest high camp. Explore the snowcapped region and experience the paradise view of MT Manaslu sitting on its lap. Return back to base camp and rest overnight. Day 10: Samagaon to Namrung. Today we trek down from Samagaon to Namrung. While trekking down we explore the cultural villages and their religion. Rest overnight. Day 11: Namrung to Dang. Day 12: Dang to Jagat. Today we trek from Dang to Jagat walking for 4-5hours. Rest overnight. Day 13: Jagat to Machhakhola. Today we trek for 5-6hours trekking from Jagat to Machhakhola. Rest overnight. Day 14: Machhakhola to Arughat. Today we trek for 4-5hours all the way from Machhakhola to Arughat. Rest overnight. Day 15: Arughat to Kathmandu by bus or by car. Today early morning scenic drive from Arughat to Kathmandu valley. We drive for 7-8hours. Rest overnight. Hope you enjoyed the trek to Manaslu region. Farewell.